Kay Brooks has been a Sewing Retailer, Educator, Author, Product Designer and Manufacturer for the Home Sewing Industry over two decades. 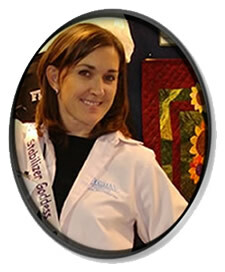 Fifteen years ago she discovered she was not satisfied with existing Home Embroidery Products, and set out on a mission to build the perfect line of for The Home Industry. She called it Floriani and today it is one of the most recognized names in the Industry, both Nationally and Internationally. Since introducing Floriani for embroidery, Kay has created a line of similar products for Jenny Haskins, and a line of Quilting Products for Alex Anderson. Sewing School attendees will love her down to earth relaxed presentation and will be amazed at what they themselves did not know or fully understand about perfect embroidery. She has been dubbed, The “Stabilizer Goddess” by many who have her workbook, or purchased her videos. This teacher of teachers and manufacturers, is a special treat at the Sewing School conferences, but be prepared for the sweet southern accent!